“Portrait of a Woman”, one of the most famous paintings by Picasso, was painted in 1936. This time experts refer to the period of surrealism in the works of Picasso, when the artist for more than ten years seriously became interested in this direction, creating many outstanding examples of surrealistic painting. Surrealism is characterized by a significant strengthening of the feminine principle, embodied in the originality and pictorial features of the canvases: instead of sharp, broken lines and angular figures characteristic of cubism, rounded, soft forms take center stage; the paintings acquire bright, saturated colors and are marked by extremely high sensuality, not characteristic of other styles. The greatest degree of surrealism occupied the attention of Pablo Picasso from 1925 to 1937, when he was already a middle-aged man, gaining great fame and great fortune. Some researchers, including contemporary art critics, call this time the period of the artist’s highest flowering. Significant changes in these years occurred in the personal life of Picasso: in the 1930s, some Maria Theresa, his new beloved, became the main inspiration for the artist’s work. The picture has another name – “Reading Woman”. 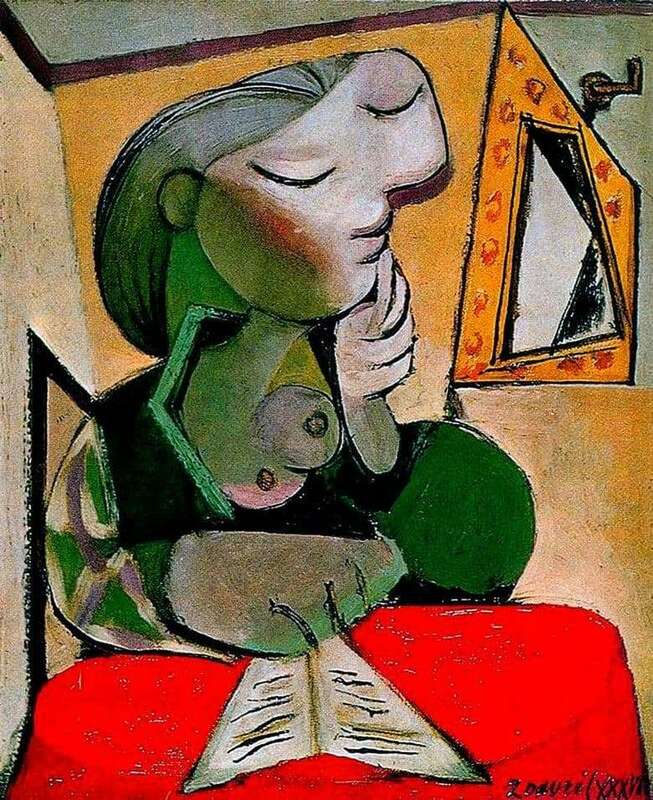 A woman sitting behind a book – Pablo Picasso repeatedly returned to this theme in the later periods of his work, but this typically surreal picture appears to be the most vivid, highly harmonious, filled with tenderness and strong emotions. Now the “Portrait of a Woman” of 1936 is kept in a private collection.